Chanteur Country US né Robert Moncrief à Anniston (Alabama). US Country singer born Robert Edward Moncrief, 18 January 1926, Anniston, Alabama. 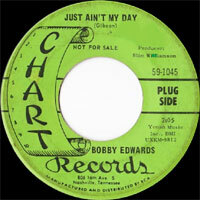 Bobby Edwards had one of those moments that every singer or songwriter lives for when he wrote "You're the Reason" in 1961, a # 11 pop and # 4 country hit. 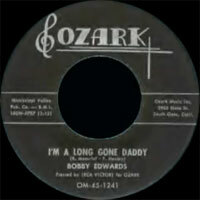 The son of a preacher, Edwards first recorded for Pappy Daily at 'D' Records in 1958, under the name Bobby Moncrief. In 1959 he revived Tex Ritter's "Jealous Heart" on Bluebonnet ; the record was reissued on the Manco label in 1962. 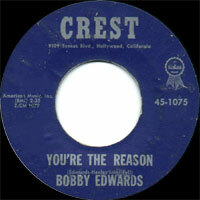 Then Edwards went out west, working shows on his own in southern California before song- writer Terry Fell placed him on Crest Records, and helped produce and arrange "You're the Reason". Though Bobby wrote all of the song, his manager (Fred Henley), his financier and Terry Fell all got a quarter share. Cover versions by Joe South and Hank Locklin hurt Edwards' sales a little. On "You're the Reason", Edwards is backed by the Four Young Men, a Vocals group that recorded a series of non-hits for Crest, Dore and Delta between 1961 and 1963. Eddie Cochran is alleged to play guitar on some of their Crest sides. 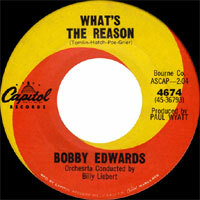 Like a vulture, Capitol Records snatched Edwards away from Crest and released a carbon copy of his big hit in the shape of "What's the Reason" (yes, the same song that Fats Domino recorded). 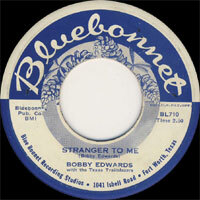 Peaking at # 71, it was Edwards last pop hit, though he did have another country hit with "Don't Pretend" (# 23) in 1963. But Edwards had high hopes when Capitol signed him. He swears that Capitol bought him a house in the Nashville suburb of Hendersonville, and tried to make him the kingpin of their eastern roster. 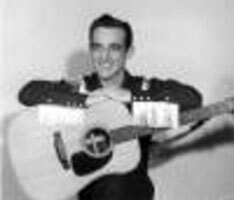 He appeared on the Grand Old Opry and toured often with Cowboy Copas. Also, he returned to the song that had been his debut on 'D' Records, "Here's My Heart". At the end of the Capitol deal, Edwards moved on to Musicor and Chart Records. He stayed in the Nashville area, then returned home to Alabama as a gospel singer, before retiring to the Nashville suburb of Smyrna.